For use on non-ferrous metals. Place sheet metal on a steel bench block or anvil and strike sharply. Use the small designs to pinpoint texture in a certain area. Large designs can cover a bigger area. Faces are domed so use Tilt and Tap method when striking. Multiple tips to layer textures on one another. Each tip is easily and securely attached with a threaded collar. Tips are approximately 7/8" with various textures. Head weight with 2 tips is approximately 8 oz. Brass domed heads are softer than the stainless so there will be less bounce back when using them. Textures include: open bullseye, dots, small divot, wide stripes, crosses, solid bullseye, flat and domed brass heads, flat and domed stainless steel heads, and flat and domed nylon heads. 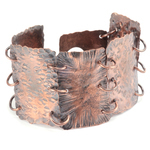 Hammers similar to this are used in our Hammered Textured Metal and Bodacious Bangle online classes with Kim St. Jean. We love this texture hammer. There are so many different looking textures you can make be just rotating the hammer or by striking the metal with several different faces. I love this hammer. It is strong and works very well. I like it much better than the wooden version which is light and flimsy. Can be used with the flat brass head to make strong impressions with design stamps. I received yesterday this hammer and didn't use it yet, but realized it's strong and I think I'll like and use it very much.